(b. 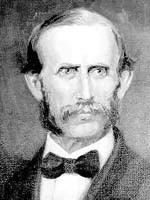 1825 d. 1900) From 1871-1877, Davidson College had no official president, but was administered by a faculty chairman, Professor John Rennie Blake. The position of Chairman of the faculty replaced the college presidency for those years. Blake was born in Greenwood, South Carolina and attended the University of Georgia and Harvard’s Lawrence Scientific School. Before coming to Davidson College, he taught at the Presbyterian Female School in Greensboro, Georgia, and LaGrange Synodical College in Tennessee. Blake was elected professor of Natural Philosophy at Davidson in 1861. The years of Blake’s administration were hard times but the college produced two outstanding alumni: Thomas Woodrow Wilson (1873-74), and Robert Brodnax Glenn, class of 1875, first alumnus to become governor of the state of North Carolina. In 1877, the Board of Trustees decided to restore the office of president. Since Blake was not an ordained minister and the constitution of the college then required that all presidents be ordained, Blake was not eligible for the presidency. He remained on faculty, however, serving as vice-president and teaching courses in Natural Philosophy and Astronomy until 1885. Robert Hall Morrison, Samuel Williamson, Drury Lacy, John Lycan Kirkpatrick, George Wilson McPhail, John Rennie Blake, Andrew Dousa Hepburn, Luther McKinnon, John Bunyan Shearer, Henry Louis Smith, William Joseph Martin, Jr., Walter Lee Lingle, John Rood Cunningham, David Grier Martin, Samuel Reid Spencer, Jr., John Wells Kuykendall, Robert Fredrick Vagt, Thomas Warren Ross, Sr.
Beaty, Mary D. A History of Davidson College. Davidson, N.C.: Briarpatch, 1988. Beaty, Mary D. and Sarah Merritt. “Davidson College Time Line and the Evolution of Chambers.” Davidson Journal 1 (1987): 12-13. Cromartie, Caroline King. The Physical Development of Davidson, North Carolina: An Historical Analysis. Davidson College Honors Thesis, 1978. Davidson, Chalmers Gaston. “Davidson Celebrates.” Davidson Journal 1 (1987): 2-7. Davidson, Chalmers Gaston. Mid-Point for ’28. Davidson, N.C.: Davidson College, 1953. Fischer, Karl W. The Mystics and Beta Theta Pi. Germantown, PA: Beta Theta Pi, 1940. Giduz, Bill. “President Vagt Announces His Plans to Retire.” Davidson College. 8 June 2006. Found on the World Wide Web at <http://www2.davidson.edu/common/templates/news/news_tmp02.asp?newsid=6550>. Kelley, Robert Lincoln. Davidson College: A Diagnosis and a Prescription. Lancaster, PA: Council of Church Boards of Education in the U.S.A., 1926. Lingle, Walter L. Memories of Davidson College. Richmond, VA: John Knox, 1947. Logan, Van Lear. “Growing Up in Davidson.” Davidson Journal 1 (1987): 20-23. Ramsey, Robert Wilson. Milestones Backward Run: The Story of Beta Theta Pi at Davidson,1858-1940. Davidson, NC: The Phi Alpha Chapter of Beta Theta Pi, 1940. Ratliff, Charles E. Economics at Davidson: A Sesquicentennial History. Davidson, NC: Davidson College, 1987. Scherer, John P. A Code of Civility: Antiwar Dissent at Davidson College During the Vietnam Era. Davidson College Honors Thesis, 1989. Shames, Steven A. A Good Faith Effort: Integration at Davidson College. Davidson College Honors Thesis, 1996. Shaw, Cornelia Rebekah. Davidson College. New York: Fleming H. Revell, 1923. Shaw, Cornelia Rebekah, comp. War Records of Davidson College, 1917-1918. Charlotte, NC: Presbyterian Standard, 1923. Spencer, Samuel R. The First Year. Davidson, NC: Davidson College, 1969.